We just finished with our Grand Camps for the summer. This is a time when we take each of our grandchildren for several days and do fun activities with them while they stay with us in our home. We only have two grandchildren so it may be a little easier for us as we take each one at a different time for their special Grand Camp. Our youngest is 3 ½ and gets very homesick so we only had her for 3 days. We picked her up (she lives 2 hours away) and stopped for fun halfway home, then had her for two more days and then took her home on the third day. That made only two days away from her family which was just right for her. Out oldest is 6 and thankfully has never been homesick, although she does miss her family and talks to them on the phone some days. She stayed for a week. Other grandparents with more grandchildren have lumped cousins of appropriate ages together so the activities will be age appropriate and they can get to know their cousins better. However you do it or whenever you do it, I encourage you to try this with your grandchildren for you will receive the special blessing of really getting to know them without the presence of parents or siblings. It becomes a special bonding time for all of you that restores the connection of generations. This year we did many activities together. We had devotions from a Berenstain Bears Storybook Bible, attended amusement parks, visited a lighthouse, went fishing in the creek (the 6 year old caught her first fish), swimming in the little plastic pool, miniature golf, the zoo, a trip to Build A Bear, a picnic, lots of outdoor fun in the yard, games and crafts in the evening and family fun with their Aunt who lives near us and they don’t see often. Each day was filled with fun, but most of all an opportunity to have extended and unhurried time of fellowship with one another. We lavished much love on each child and they returned many hugs and kisses and fun back to us. I remember in my childhood the few times I was allowed to stay with my Grandmother Noble on her farm and sleep near the room my Daddy (whom I never met since he was killed just before I was born) slept in. I lived in town, but Grandma Noble lived on a farm with a hand pump for water for the house and an outhouse for a bathroom. They were very special times. My Grandmother Starkweather lived with us, but there were special times with her also, when I visited her in her upstairs apartment to work on puzzles or just talk, that fill me with warm memories and the sense of being much loved. God loves to lavish His love on us and hopes that will encourage us to “lavish” love on the members of our family and on all of those around us. In a hectic world we need to take time out to not just love our families but to “lavish” love on the people closest to us. It helps others be open to see the possibility of a God who lavishly loves His people and it is the glue that reminds us all of the importance of a family knowing, enjoying, and loving one another. It is this inheritance, this knowing that we are loved by our family and our God, which gives us strength to continue on in the hard times. 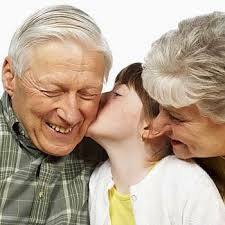 Grandparents are a great gift to grandchildren. They find it easy to lavish love on the next generation and give them a feeling of continuity and stability of family. If you haven’t tried doing a Grand Camp don’t wait until next summer; instead start small over a school vacation. Once you try it you will be hooked! Happy Grand Camping!